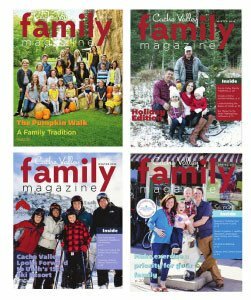 Cache Valley Family Magazine is a free publication that is delivered through the backpacks of Cache Valley school children, placed in local grocery stores, libraries and other public venues and is mailed to a rotating list of 7,000 Cache Valley residential addresses. However, if you aren’t local and/or you want to ensure Cache Valley Family Magazine is mailed directly to your home every time it is printed, you can subscribe and pay only for shipping and handling. Select option below to receive all five issues of Cache Valley Family Magazine (printed in January, March, May, September and November). Subscriptions are for one full year, so no matter when you subscribe you will receive a full cycle of publications.